Want to try something new in the classroom? Need a little funding to get started? Apply for a Teaching Innovation Grant. 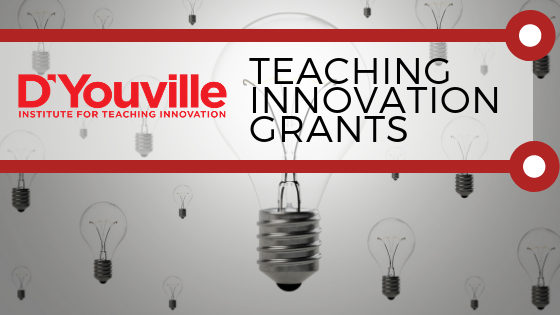 Teaching Innovation Grants are designed to assist faculty implementation of a new approach to your teaching. You may use a Teaching Innovation Grant to obtain classroom materials, additional training, or to obtain software or other technology that will impact student experiences in your course(s). To apply for funds, fill out this short form. Apply for up to $500 to purchase the items that will help you advance your teaching. Grantees will be selected on a first come, first serve basis (if their application meets the criteria) until the year’s budget line runs out. Looking to implement strategies in a new teaching and learning book? Apply to purchase that book. Want to implement a new project that requires digital recorders? Apply to purchase recorders. Looking to use a new piece of software to enhance online discussion in your courses? Apply to purchase this software.